Knuffle Bunny Free is the third and bittersweet final chapter in the much beloved Knuffle Bunny series. I've been looking forward and a little dreading it's release as I really did not want the story to be over. Though children grow up and it's only a matter of time but what Trixie and Knuffle Bunny share in their friendship of little girl and plush adorable rabbit is something that will live on in the hearts of children. Actually her relationship with her plush bunny reminds me so much of my love for a little plush puppy dog named "Scruffy" that I carried with me practically everywhere when I was little. Scruffy now sits in a box in the attic awaiting a time when my boys can properly take care of him and hopefully love him as much as I did, and I think he's the big reason why I adore the Knuffle Bunny series. In Knuffle Bunny Free, Trixie and Knuffle Bunny are off to Europe on vacation to visit Trixie's grandparents. The trip on the plane is full of adventure but when Trixie realizes that Knuffle Bunny is missing she has to face the realization that she may have to do a little growing up without her faithful companion. I have to admit there were some tears shed on my behalf though the ending is not nearly as sad as it sounds, its certainly bittersweet. I won't tell you exactly what happens in the end but it's a great closure on a series of books that have been a staple in this household since Connor was born. 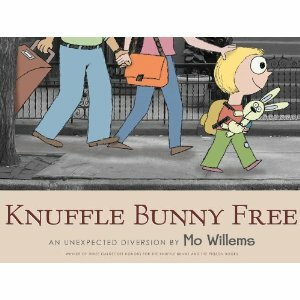 Knuffle Bunny Free : An Unexpected Diversion is available right now and you can pick up your copy on Amazon ! Disclosure: We were given a copy of Knuffle Bunny Free : An Unexpected Diversion free of charge, we were not compensated for this post in any other way. My opinions and comments on items we review are always my own and are never influenced by sponsors.